You reap what you sow. And when it comes to fitness, sowing enough to reap results can be a challenge. Farmer Gym's Almanac destroys your excuses and plows through your obstacles by giving you the tools to develop a sustainable workout regimen you can perform anywhere, anytime. With over 400 mostly equipment-free workouts, Farmer Gym's Almanac teaches you how to use your body as your machine and your environment as your gym. The result is a harvest of total-body fitness, built upon simple principles and earnest labor. 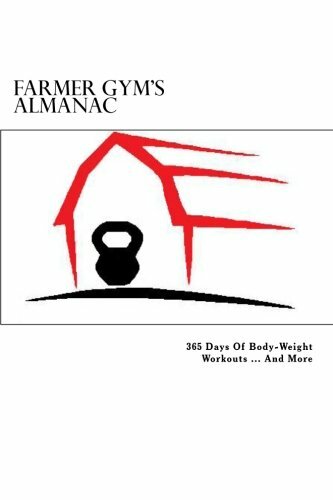 "Farmer Gym's Almanac is knowledgeable, innovative, and convenient, catering to the participant's strengths, as well as schedule. Mr. Harle's creativity will inspire participants while thoroughly educating them on proper form and progression as they plow toward their fitness goals." "Farmer Gym's Almanac helps people improve their fitness. With sustainable targeted workouts, the book's exercises provide variety, building strength and cardiovascular endurance by means of total body conditioning." "I have owned this book for quite some time now, and it's usefulness has not been worn out yet. The book shows you tons of moves and the workouts are put together very well, using all of those moves. You can tune the workout for beginner to extreme athlete. Usually when I'm looking for a break from the gym, or just traveling, I turn to this book for a great workout. If you do HIIT a couple times a week, just look to this book for the workout and crank up the pace. If you want to get in shape, the tools to do so are in this book!" "This almanac gives you enough variety in the workout routine each day to ward off boredom, with a different daily routine for an entire year. I'll never have to pay gym dues again or buy that stuff that they sell on TV at 4 AM, just so I can sell it to someone else in a garage sale a couple of years later. I like the fact that the exercises are easy to understand and that I can adjust the intensity to match my fitness level. Since the book costs less than one month at the gym, it was a no-brainer for me." Starting at minute 0, perform an exercise for 20 seconds followed by 10 seconds of rest. At the 30-second mark, perform the same exercise another 20 seconds, followed by 10 seconds of rest. Repeat this process a total of 8 times; therefore, you finish at the four-minute mark.